The past two nights we journeyed back in time to Bethlehem. 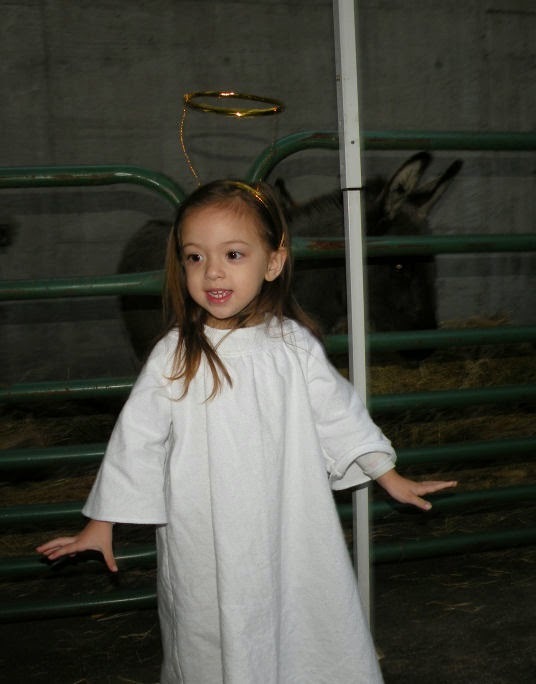 I played Mary the mother of Jesus, Hubby dressed as Joseph, and Miss M was a mostly-well-behaved angel. Our new little man was, of course, the star as he played Baby Jesus. 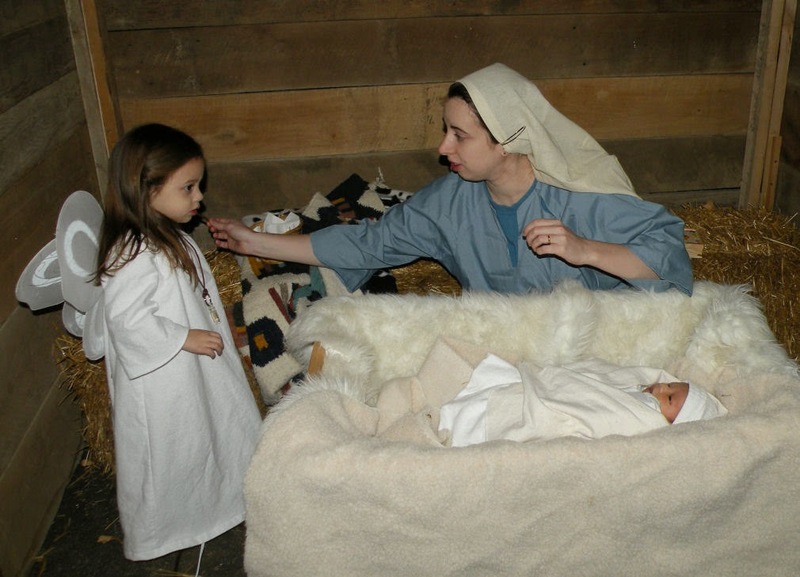 It was a big hit with the children visitors to have a real baby Jesus! One little boy brought the flute he made inside the "market" back out and asked if he could play a song for Jesus. Who could resist such a request?! My little angel procured her own fan club over the course of the two evenings. She did all the activities at least three times and received special treatment from all the "shop keepers." It was good for her ego since she saw her brother getting so much attention. She has no modesty whatsoever (which I'm not concerned about at this age) and when people told her she was beautiful angel, she simply replied, "Yeah, I am!" It was a once in a lifetime opportunity...there won't be another Christmas where we'll have a newborn baby to play Jesus! We had a lot of fun, despite the chill. I made Miss M's costume (sans wings and halo) from some white flannel I picked up at JoAnn's on Black Friday. It went like this... Buy fabric Friday morning. Wash fabric Friday afternoon. Cut out pattern Friday night. Sew costume Saturday. Wear costume Sunday and Monday. I used pattern #6, the "Dolly Dress," from Ottobre 6/2008, which I had already traced in size 74 width and 86 length. I added 9 inches to the length and left out the elastic at the wrists. When I go to make this pattern "for real" and not for a costume, I think I'm going to need to add an inch or two to the sleeves. Miss M has long arms! I plan on letting her wear it as a nightgown once it's thoroughly washed. Miss M is much more angelic asleep than when she's running around like a spoiled diva! I'm so glad she has a brother now and I hope to temper some of her strong will -- or at least help her learn to use her strong will in a way that is more becoming. Incidentally, my biceps are sore from holding the baby so many hours in a row! I usually put him in my mei tai when I'm going to be holding him so long. 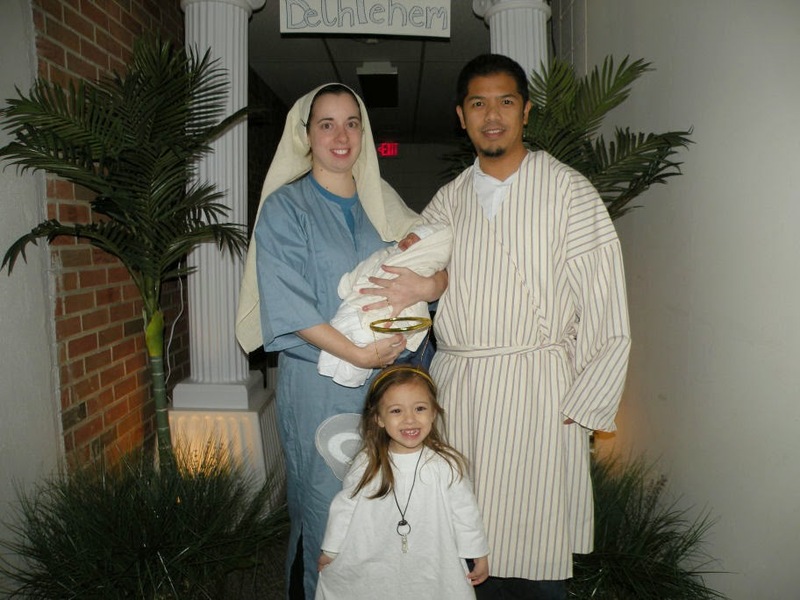 That is so sweet that your newborn son was Jesus for the living nativity!